It’s summer time and the living is easy, maybe a little too easy. Perhaps you’re looking for something to do to fill your extra time. Many adults can find wonderful part-time jobs during the summer months. Take a look at the many opportunities out there that may suit your interests and experience. Dog Walker/Pet Sitter: Do you love animals and enjoy being in the warm sunshine? Many families take vacations during summer, which means someone will need to watch their furry friends. The best part is that it’s not only great exercise for the pet but for you as well. And pet sitting isn’t limited to summer alone. There are plenty of times to take advantage, such as spring break and the holidays. You can check online or at your local pet store for inquiries. Online Tutor: With online tutoring, learning can happen anytime and geography isn’t a limitation. Flexible hours mean that you’re still able to travel, enjoy spending quality time with loved ones, and work out of the comfort of your own home. People need tutors at all education levels, so you have the ability to mentor and teach at the tier that best suits you. Bookkeeper: Numbers, numbers, and more numbers! Many companies often look for bookkeepers to help aid and facilitate their finances. Responsibilities can vary depending on the size of the company. Some duties may include maintaining and updating receivable and payable accounts, producing financial reports, overseeing audits, and reviews, and processing payroll. It is a great position for those who have a background in accounting and a passion for numbers. Tour Guide: Explore the great outdoors or indoors as a tour guide. Lead the pack around historic sites and attractions while getting to know others around you. It is important to have strong communication skills, a sharp memory, and lots of enthusiasm while guiding people through the tour. Your job will be to make it a fun and memorable experience for everyone and to be a knowledgeable resource to those around you. Librarian Assistant/Aide: Calling all bookworms! The summertime is a busy season for readers who want to stay mentally engaged while traveling or enjoying time off. 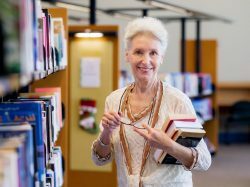 If you have a love for books and enjoy helping others, consider becoming a library assistant or aide. This position comes with flexible hours as libraries are in need of help shelving books, assisting customers locating books, and tracking/cataloging overdue materials. Summer is a great time to get involved in your community and no matter what summer job you choose, you’ll be learning something new! Research is key when it comes to finding out what best suits your expertise and interests, so explore what opportunities are available. Making money and doing what you love, what more could you ask for?